When you start a new game, you will be prompted to make a profile for yourself, as the Tactician of the protagonists’ army. If you’re starting Eliwood or Hector’s story, you can skip making a Tactician, while it’s compulsory for Lyn’s story. Name: No effect on gameplay. 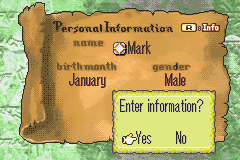 The default name is “Mark”. Birth Month: This affects the Tactician’s elemental Affinity. If a character’s Affinity matches with the Tactician, they receive a minor statistical boost (see Tactician Bonus). Gender: Depending on which you choose, it slightly affects how characters address the Tactician. You can view this information from the Fortune-Tactician window during Battle Preparations (the option will appear once you’ve reached a certain stage in the game). Note: The following chart applies for the English version only. The Japanese version included an additional setting (Blood Type) which was also a deciding factor. 0 for E Rank, 1 for D Rank, 2 for C Rank, 3 for B Rank, 4 for A Rank and 5 for S Rank. The maximum obtainable stars is 10. For each Tactician star, all playable characters receive +1 Critical Evade. Playable characters with the same Affinity as the Tactician receive an additional +1 Accuracy and +1 Avoid for each star. When the Tactician is present, some characters will briefly speak to the Tactician when the battle begins. The character that appears depends on the current chapter you’re in. At the end of Chapter 22 (Eliwood’s story) or Chapter 23 (Hector’s story), or the corresponding sidequest chapter if you chose to accept it, you will obtain the Afa’s Drops item. However, you will only obtain it if the Tactician is present. The Afa’s Drops increases a character’s growth rates by +5% to every stat. There are two slightly different versions of the Epilogue, depending on whether the Tactician is present or not. Some guides claim that characters with the same Affinity as the Tactician have all their growth rates increased by 5%. This isn’t true.